Don’t worry, and don’t scramble. Choosing the right technology for the job is more important than choosing quickly. Carriers that are currently using an Electronic On-Board Recorder (EOBR) or Automatic On-Board Recording Device (AOBRD) are afforded a four-year grandfather period to meet the ELD requirement. This brings them to December 10, 2019, though the use of a paper-based solution will get carriers into trouble in 2017*. 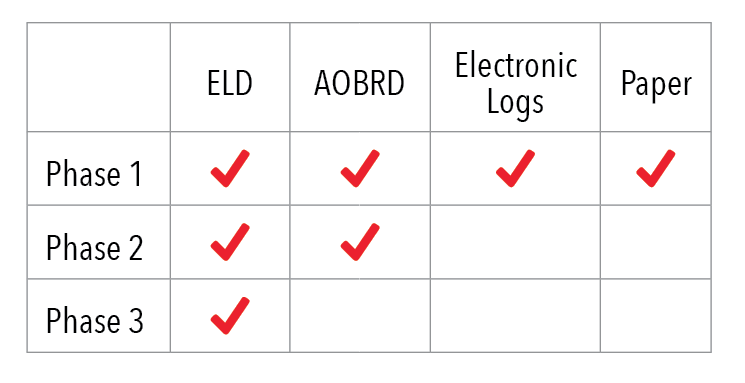 To reduce the costs associated with the ELD mandate, the mandate no longer requires a hard-wired connection – Bluetooth and/or USB is fine. As a result, cheaper software and in-truck hardware has emerged. This is a huge benefit to the carrier industry that translates into reduced issues with printing logs or other required documents while on the road. The net result will/should be a lower initial price tag for these devices, as well as the need to pay monthly subscription fees goes away. This results in reduced incidents of drivers running out of time in transit and being forced to take untimely off duty time to recoup hours. This should prevent both deliberate and unintentional HoS violations and help drivers and carriers avoid fines, and other regulatory concerns due to mistakes in paper logs. This will translate into lower crash rates. Insurance companies view carriers with lower roadside inspection violation rates much more favourably. Therefore, having a managed process to maintain safety can translate into lower insurance premiums. More accurate and consistent HoS records will also facilitate enforcement and support carrier business operations, such as more effective dispatching of drivers to have sufficient time to complete trips. This mandate has been talked about for a number of years now. Therefore, it was not so much if the rule would pass, but rather when. 4. This may not even impact your fleet! • Truckers operating vehicles older than model year 2000. A driver must also have in the truck the user manual for operating the ELD. This includes step-by-step instructions for transferring HoS records to an inspector, how to report ELD malfunctions, and a supply of at least 8 paper grid graphs. Now before you rush out to trade in your tractor for a pre-2000 year model, or try to compress your work schedule below 8 days in a month think of the positives, and don’t panic. With better measurement of hours of service, you will improve your planning, drivers will get home more often and loads won’t be compromised by drivers that run out of hours on route. This is peace of mind. 5. This IS NOT happening all at once. Phase 1: Is the awareness and transition phase. The timeframe is between the 2-year period following the publication of the ELD rule from February 16, 2016 to December 18, 2017. During this time, carriers and drivers subject to the rule should prepare to comply, and may voluntarily use ELDs. ELDs that are registered and listed on the FMCSA website. The timeframe is between the 2-year period from the compliance date to the full compliance phase. This represents 4 years following the original ELD rule publication of December 18, 2017 to December 16, 2019. EOBRs that were installed prior to December 18, 2017. Certified, registered ELDs following rule publication December 16, 2015. Phase 3: Is the full compliance phase: After December 16, 2019 all drivers and carriers subject to the rule must use certified, registered ELDs that comply with requirements of the ELD regulations. Once you have had the time to understand the clear benefits of ELDs you may look back at this major milestone five years from now as the best thing that ever happened to the industry!